Some islands and regions of Scotland seems to be gaining their own unofficial flags in last years. Looking at them, I noticed that the Isle of Arran, the biggest on the Firth of Clyde, is flagless. A black saltire on white was the arms of the 5th Lord Maxwell, regent of the island (practically, a monarch) for five years in early 16th century. The saltire was turned in a Nordic cross, as the island was ruled by the Kingdom of Norway during the Viking Age. On the canton, a black lymphad with red flags, heraldic augmentation gained by the earls (now, dukes) of Hamilton when they became earls of Arran. 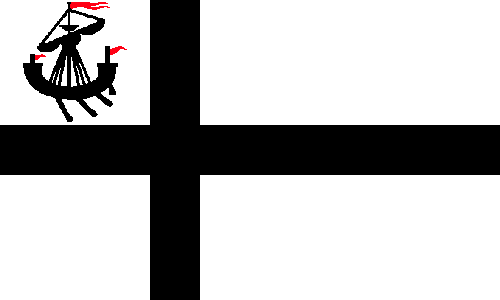 As far as I know, the black Nordic cross on white is currently unused by any entity, at least in United Kingdom. No, this post in not intentionally related to Scottish refendum. While Egypt held Sudan in a condominium with United Kingdom, there were distinct political and administrative between the two countries; with Sudanese independence, both countries claims the Halai'b Triangle for themselves (making it a disputed territory), but Bir-Tawil for the others (making it a de jure terra nullius). Due to the unclear sovereignity over these two areas, I intended to design "neutral" flags, that could be used by the two sides indistinctly. Both flags used pan-Arab colors. 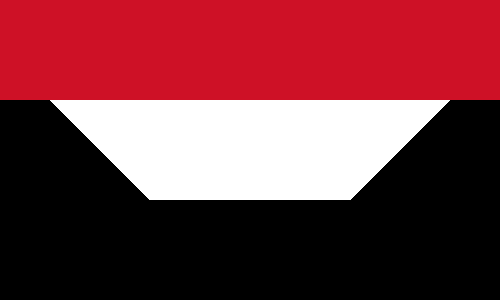 Both Egypt and Sudan use red-white-black (in this exact order) horizontal tricolor flags. The white trapezium represents the shape of the area and its location between the two countries. 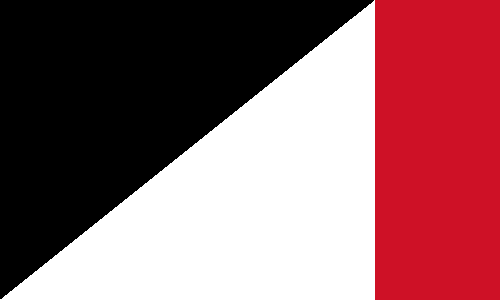 Red represents the Egyptian desert, as the Ancient Egyptians used to distinguish the black, floodable "black land" from the desertic "red land". Black represents Sudan's name etymology, "black man". As explained for the previous flag, the black color represents both Sudan and the fertile Egypt. The red stripe in the fly represents the Red Sea. The triangle is obvious. I think the result was two unique flags, but still very simple. Please, no politics on the comments. 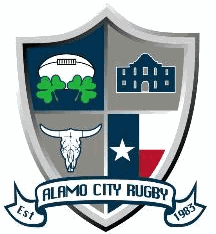 Alamo City Rugby Football Club is a rugby union team based in San Antonio, Texas, USA. Recently, their "heraldic" badge appeared on the Heraldry Hall of Shame Facebook group, devoted to collect notably bad examples of heraldry. There are some issues that makes it un-heraldic: dark grey isn't a color traditionally found in heraldry, and there are many contrast issues (for examples, green on blue and blue on grey). So I decided to make a more heraldic version of it. From the fourth quarter, the Texas flag was rotated and became an inescutcheon (a shield on the center of a bigger shield or part). 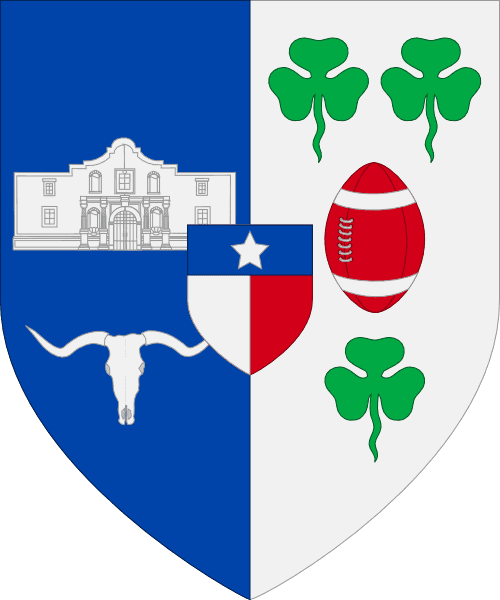 The vertically-divided shield (said per pale in heraldic jargon) has two interesting features: each part refers to part of the club's name ("Alamo City" and "Rugby"), and their blue-white contrasts intendedly well with inescutcheon's white-red. The first part is blue (the main color of the team) and contains the Alamo fortress, that gives the club its name, and an ox's skull, commonly featured in the symbol of the team. I like the result of this part because the Alamo, made of limestone, really has a white color, and the white skull on blue appears to be an unofficial logo of the club. The second part has a vintage leather rugby ball (that I colored red with white details) between the green shamrocks (often represented in heraldry as trefoils), in a motif that alludes to the first quarter of current design. I like the way that, without adding or removing elements, it's possible to transform a then totally un-heraldic device in a charming and conventional coat of arms. Comments and suggestions are gladly welcome. I'll probably return with flags next weeks. We had two consecutive "etc." posts. The Mercosur, a regional bloc comprising Argentina, Brazil, Paraguay, Uruguay and Venezuela, intends to adopt uniform vehicle registration plates, like European Union already did. Trucks and buses must adopt it from 2016, other vehicles from 2018. On recent news, it's possible to see prototypes for the model, that can be seen here. I think the model rather ugly, so I decided for my own attempt. The plates on the linked image follow the color scheme of respective countries. I'll, at first, design an unified color scheme, totally inspired in Mercosur's flag. They contain the blocs's flag (in Portuguese for Brazil, otherwise in Spanish), the national flags, the countries names in native language and the local identification (already used in Brazil, Uruguay and Venezuela). I particularly like the layout, and I think it's more similar to the current plates on the countries. I don't think a QR code is needed. As I early wrote, the basic layout can be adapted to current colors and customs. Below, for example, there are vehicle plates inspired in current Brazilian ones. I'm particularly happy with the results, because I achieved a clever color scheme with contrasting colors (fundamental to every type of plates). You can see my post about Mercosur flag here.